If you are looking for bold, bright and pretty florals - the perfect florals for this season - look no further than Who What Wear. Who What Wear is the smart, chic, sophisticated, well-made and very affordable brand at Target, currently its best brand. For all of you working in an office or teaching/work at a school, this line has a lot of elegant, chic, work-friendly pieces too. But you can also find more everyday styles and casual clothing as well as so many current trends: Summer Plaid, Embroidery, Light Blue Pinstripes, Blush Pink, Off-Shoulder, Ruffles, Peplum, Cold-Shoulder, Bombers, Block Heels, Statement Bags. etc, etc. Every time Who What Wear has some fun prints in any of their collections, they offer them in different clothing items. My skirt and blouse are both from Who What Wear. Both prints were offered in two different style dresses, pencil skirts, blouses, bomber jackets, pumps and purses. 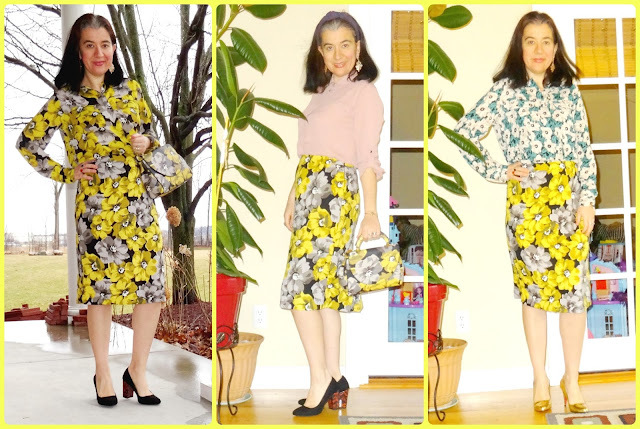 I own the yellow print here both in the pencil skirt, blouse and bag version (you will see it below on the bottom of the post) and the green print I own in a bomber jacket, too (worn here). 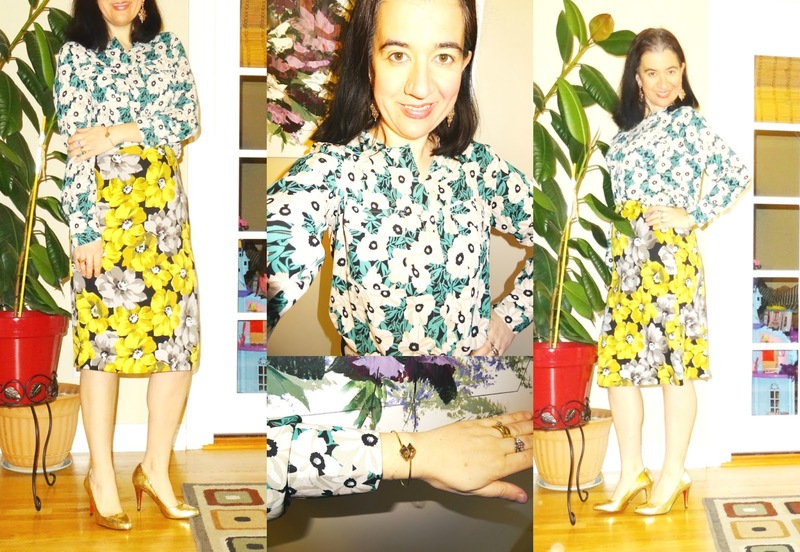 These particular florals paired together worked for three reasons. 1] Green and yellow go great together. 2] One print is larger and one smaller. 3] Both florals on each piece are kind of the same type of flower if you can tell. I think my Python Embossed Gold Louboutin Pumps here looked great. All I needed were some Statement Earrings, also in gold. And I was done! Have you ever worn florals both on the top and on the bottom? Do you like how I did it here?! 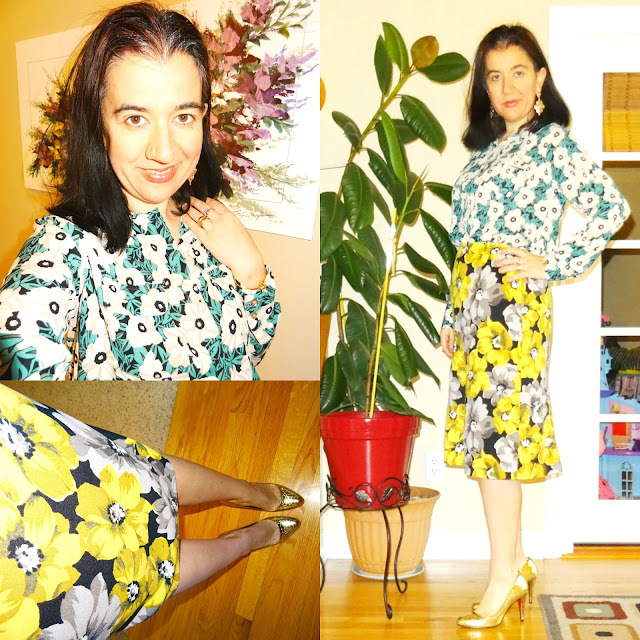 Bright Yellow+Gray Large Floral Print Blouse w/ Chest Pockets: Who What Wear via Target (identical for a Steal! ), (similar in olive w/ laceup neckline, Great Deal, love this), (similar, Small Splurge). Bright Yellow+Gray Large Floral Print Pencil Skirt: Who What Wear via Target (identical for a Steal! ), (similar, Huge Steal), (gorgeous option, Splurge, my Favorite). Gold Python-Embossed, Almond Toe Pumps: Christian Louboutin (very similar current option, Splurge, my Favorite), (quite similar, Huge Steal), (similar w/ kitten heels). Take a peak below at all 3 work-wear looks I have created with this Floral Pencil Skirt for Spring. It looks great with a silky blouse tucked in, doesn't it? !